Visual Studio Code>Programming Languages>TM1 HelperNew to Visual Studio Code? Get it now. 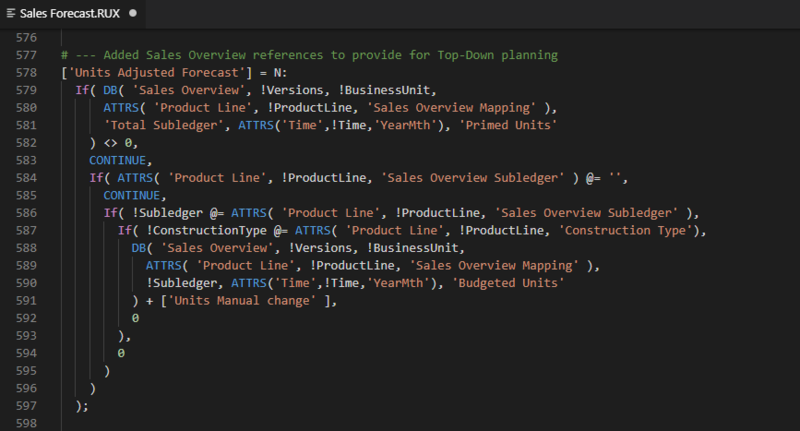 TM1 Syntax Highlighting and Snippets extension is a set of syntax highlighting files, code completions and snippets for developing rules and Turbo Integrator processes in IBM Planning Analytics/IBM Cognos TM1 server either local or on the IBM Cloud. CarpeDatum provides planning and analytics consulting and product development services for IBM, Microsoft, Tableau, and Qlik since 1997. Our highly skilled consultants have years of real-world experience in financial analysis, business intelligence, performance management and information systems. We apply this unique blend of knowledge and skill to deliver powerful value-added applications to help organizations achieve strategic and tactical goals. TM1Connect enables direct live ODBC access to TM1 cube data from standard relationally aware tools such as Tableau, Qlik, PowerBI, MicroStrategy, etc. MDX Query Building allows you to quickly generate complex MDX from building blocks of MDX statements. NOTE: The snippets and code completion includes syntax and functional capabilities up to version 2.0.6 (such as hierarchies, temporary views, etc). Some commands and code snippets may not be available on older versions of TM1. Snippets provided with this extension begin with the letter x. Press x to see the list of code snippets available, and select the desired entry. The code will be automatically inserted into VSCode and can be completed by pressing TAB through the frequently changed parameters. There are two types of MDX snippets; MDX Expressions (mdx) and MDX Queries (mdq). Using the mdx and mdq snippet prefixes, you can generate complex MDX queries from basic building blocks. p = Parameter: Variables defined on the Parameters tab should be prefixed with a “p”. v = Variables: Variables defined on the Variables tab should be prefixed with a “v”. c = Constant: Variables that are set up once and never change their value should be prefixed with a “c”. n = Numeric: Variables that contain numeric values should be prefixed with an “n”. s = String: Variables that contain string values should be prefixed with an “s”. b = Boolean: Variables that are Boolean (1 or 0) should be prefixed with a “b”. xHeader snippet provides the introduction to the Turbo Integrator script, description of operation, dependencies as well as change control sections. xLarge Code Block snippet introduces major sections of a Turbo Integrator or rule block. xMedium Code Block snippet introduces minor breakouts of a Turbo Integrator or rule block within a major section. CarpeDatum snippets provide code snippets for CarpeDatum customers leveraging our standard script library. 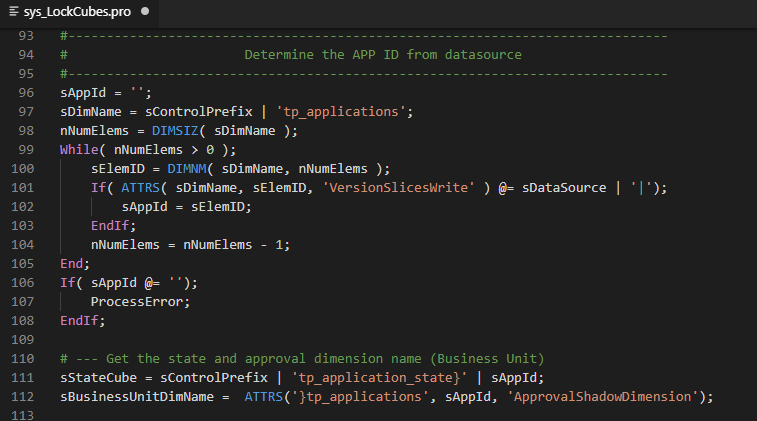 It works much in the same as standard snippets except these are not part of the standard TM1 functions or operations. You can disable these from the snippet lookup by removing the entry in the package.json file or remove the source files where these are located. We have provided a reference for your own custom Turbo Integrator code snippets by simply creating a file named custom.process.codeblocks.json in this extensions directory. It is recommended that you do not update the tm1. * files as they will change with subsequent releases. Place all of your personal snippets in custom. * and these will remain unchanged as you update new releases of this extension. We would love to hear from you! Let us know if you would like to incorporate some new snippets, have some syntax changes or additions, or if you find any errors with the ones included in this extension.